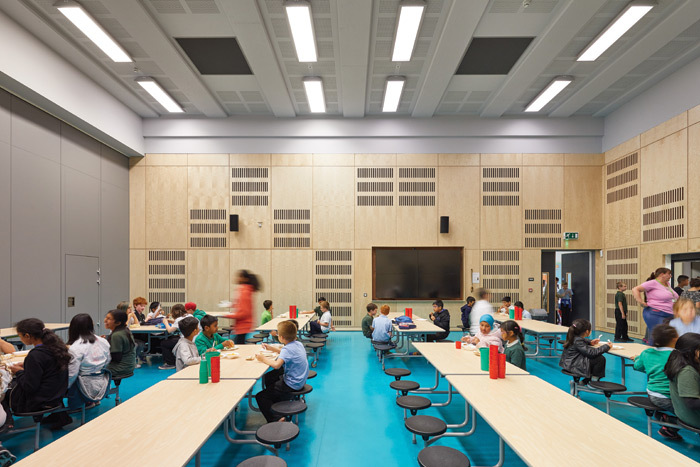 It was a tough task to convince school teachers, governors and parents at a sprawling single-storey London primary school that the future lay in expanding upwards, admits Lee Mainwaring, design director at Architecture Initiative. Predictions of a surge in birth rate in the area around the Olga Primary School in Tower Hamlets meant that school capacity needed to increase from 240 to 720 pupil places, and the existing much-loved, but somewhat dilapidated, 1982 building simply couldn’t cope with that kind of expansion. To have created a new, enlarged single-storey school would have used up most of the land, leaving little space for sport and recreation, so Architecture Initiative decided to create the new school over three levels, with a compact footprint. 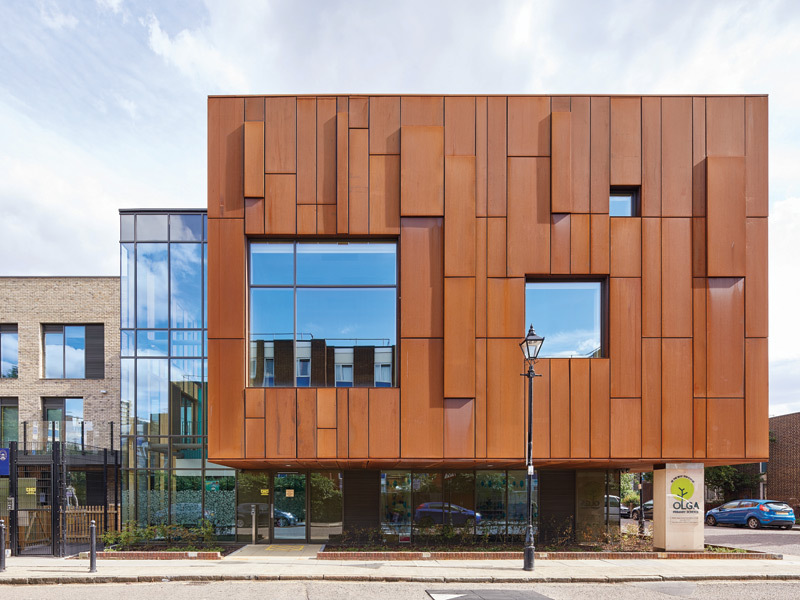 It made perfect sense from the point of view of making the most of the limited space and preserving an area of green in the urban landscape; but it also meant a lot of creative design work to satisfy the needs of staff and pupils. ‘We had to convince the headteacher that going up was the way forward, then we had to convince the governors and the staff, then the pupils and parents and, finally, even the wider community,’ says Mainwaring. ‘Everyone wanted a say in it as it’s a community building.’ What was non-negotiable, as far as the teachers were concerned, was the need for all the pupils to have direct access to the outdoors. For the nine classrooms on the ground floor (housing nursery, reception and year 1 pupils) this was simple – external doors opening into separate, but interlinked, outdoor play areas. For the oldest pupils in year 5 and 6, their six classrooms on the top floor have direct access into a roof garden. 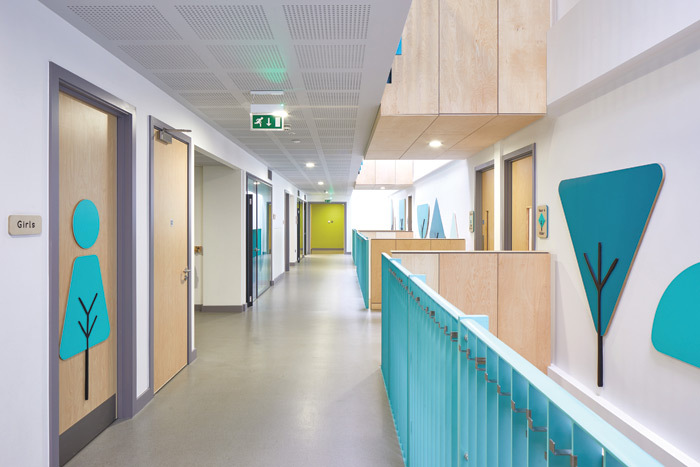 For the pupils in the nine classrooms on the first floor it was more of a challenge – solved in the end with an extensive external terrace walkway leading at one end to the hall and at the other end to a staircase descending directly to a separate playground. ‘It was essential, in order to get the teachers on board with the design, that all the classrooms had direct access to the outside space,’ says Mainwaring. Another convenience from the old single storey building that the teachers were loath to lose was the freedom to fling open the outside door of the classroom on a hot day, but that too was resolved in the highly insulated and naturally ventilated £10m new school. ‘The teachers were used to just opening the door when they were getting hot and they wanted to retain that similar “ground-floor feel” on the upper floors,’ says Mainwaring. The solution was to create functional, opening doors fully protected by louvres. ‘If you get too hot you can just open the door – it’s as simple as that,’ he says. ‘You get all the natural air coming in, but you can’t fall out.’ The natural ventilation on the exterior of the building, which helped the project to gain BREEAM Excellent status, is cunningly concealed behind bespoke, perforated panels of Cor-ten weathering steel that naturally rusts to a warm, earthy tone, complementing the London Stock brick. ‘We were there in the autumn when all the leaves were going brown, and the rusty oxidised metal cladding made it look quite natural, particularly as all the panel sizes were different,’ says Mainwaring. The interior was also designed to have a natural look: ‘The birch-faced plywood creates an open, airy, Scandinavian feel,’ he says. The raw materiality of the pale concrete and wood is complemented with splashes of bright aquas and limes, while bold graphic designs of trees in teal and green link with the real gardens to the outside.